An increasing amount of research is revealing the importance of a healthy gut microbiome in maintaining immunity, digestive and heart health, prevention of obesity and diabetes – and even in improving brain function, writes Dr Susan Aldridge, Healthy Soul’s guest blogger, freelance writer and editor based in London, with an interest in medicine, health, science and food/nutrition. The microbiome is the community of bacteria, fungi and viruses living within the gut and it consists of more microbial cells than there are human cells in the rest of the body. You are, literally, more microbe than human, in material terms! 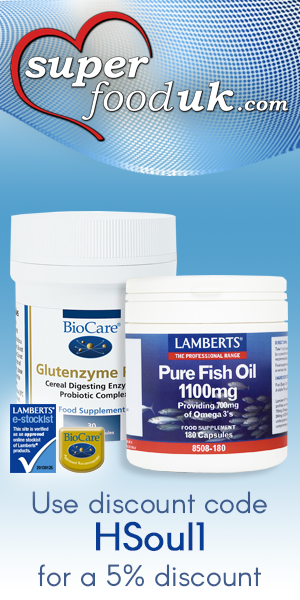 Improving the quality of the gut microbiome is basically a matter of tipping the balance between ‘good’ bacteria (mainly bifidobacteria and lactobacilli) and those which are less ‘friendly’. There are two ways of doing this: consume more prebiotics and/or more probiotics. Put simply, the fibre in prebiotics contains inulin, an oligosaccharide (complex carbohydrate) which feeds the healthy bacteria in the gut, promoting their growth, while probiotics (also known as fermented foods) actually contain good bacteria and deliver them straight to the gut. So, this month I’ve come up with three recipes that combine prebiotics/probiotics with some seasonal foods. Asparagus, onions, garlic and artichokes are all rich in inulin, but asparagus is the only realistic candidate for a green juice. So, if you’re planning a classic summer lunch of asparagus, new potatoes and salmon, grab an extra bunch and try this healthy smoothie. Place all solid ingredients in a blender/Nutribullet and top up with the milk. Liquidise and drink immediately. Sauerkraut is cabbage fermented with salt for three weeks or more. It actually contains more lactobacilli per serving than yoghurt. The bacteria occur naturally in the cabbage and, during the fermentation, they convert sugars in the cabbage into lactic acid, which gives sauerkraut its characteristic acidic taste. As interest in the microbiome grows, fermented foods like sauerkrant are increasing in popularity. I bought the only version on offer in the supermarket for my recipe, but there are many novel versions to explore in health food shops (might also be worth looking in your local Polish shop if you have one). I’m also going to try kimchi – Korean sauerkraut – which is fermented cabbage and radish with chilli and other additions. To be honest, I didn’t really fancy sauerkraut on its own (and certainly didn’t fancy making it from scratch, although it’s said to be easy!). 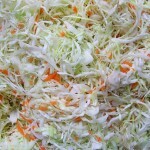 So, I put together a coleslaw, where sauerkraut replaces the fresh cabbage. And if you’re in a hurry, try mixing sauerkraut with prepared coleslaw in equal quantities. Combine all the coleslaw ingredients, then whisk up the dressing and toss it all together. To make this seasonal, serve with boiled new potatoes. To make it a bit (vegetarian) Germanic, serve with Quorn smoked ham or sausages. And to make two meals, double the coleslaw, dressing and potatoes and make up a potato salad to serve the following day with the coleslaw and more ham/sausages. Kefir is another fermented food – similar to yoghurt but made in a different way. Quark is type of soft cheese which is higher in protein and lower in fat than regular cream cheese and now there is a quark made with kefir, that seemed like a good basis for a cheesecake topped with berries. Here I mixed the kefir quark with regular quark. I’ve also experimented with feta cheese, instead of the usual cream cheese, to add a slightly savoury note and drastically cut the amount of sugar in this adapted recipe (there should be enough sweetness in the biscuit base and fruit topping). This went down very well with someone who doesn’t usually like dessert! Crush the biscuits, melt the butter and mix. Spread mixture over the base of a pie dish and chill for several hours. Beat the cheese, quark and sugar together and fold in the lemon zest. Soften the gelatine as per the instructions on the packet and melt into the lemon juice over a low heat. Stir into the cheese mixture and spoon onto the base. Chill overnight, then add berry topping.